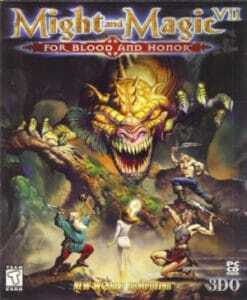 Once more, the game was first released on the NES, followed by Game Boy, Sega Genesis and SNES ports. And of course, David Wise was responsible for the scores. Out of the quartet of Battletoads & Double Dragon soundtracks, it’s the SNES one that takes the crown. Wise takes the hard rock influences from the SNES Battletoads in Battlemaniacs – where they awkwardly shared the limelight with orchestral sounds – and puts them front and centre. He’s helped by a guitar tone that is far punchier and more exciting than the thinly buzzing guitars on Battlemaniacs. 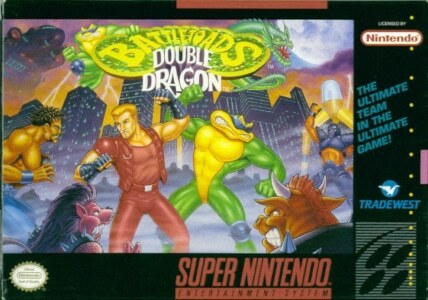 On the Battletoads & Double Dragon soundtrack, the guitars (and the rest of the rock band ensemble) are sampled to a very impressive standard that makes these compositions truly come alive. It’s hard not to think of Wise’s work here as a precursor to the amazingly realistic sounds he coaxed out of the SNES for Donkey Kong Country. What’s more, Wise’s writing for guitars is flawless, his riffs beautifully melodic yet powerful, varied and instantly memorable. Thanks to this strength, “Main Theme” successfully kicks off proceedings at a steam-rolling, mid-tempo pace that references Battletoads’ earthy rock intro, but updates it for the 16-bit era. Amidst the fist-raising hard rock, Wise tastefully sprinkles in a few synth leads that effectively underscore the game’s space location. The rest of the Battletoads & Double Dragon soundtrack follows this stylistic lead, dishing up some of the best melodic hard rock written for the SNES. “Abobo” reprises material from “Main Theme” in a slightly faster rendition, before moving through a number of various new riffs. This sort of variety and flow shapes almost the entire soundtrack. As a result, most tracks do feel like fully-fledged (if abbreviated) hard rock songs, performed on the SNES. “Robo Manus” dials up the tempo a few notches and immediately jumps into the action with utter joy and abandon. Its head-banging fury is delivered with a big grin, capped off perfectly by a clean guitar solo with a catchy pop influence. On a handful of other tracks, Wise indulges in some genre mixing that is as well executed as the Battletoads & Double Dragon soundtrack’s hard rock stylings. “Big Blag” and “Shadow Boss” bring to the table the new jack swing influences that the original Battletoads had avoided. The irony here is of course that ­Battletoads was so clearly modelled after the Teenage Mutant Ninja Turtles NES games and their new jack swing-heavy soundtracks. Wise’s tracks live up to those outstanding role models, with all the necessary cool swing and energy in their rhythms and colourful orchestrations that the SNES makes possible. “Big Blag” focuses mostly on its grooving beats, complemented by brass and organ leads, while “Shadow Boss” seamlessly merges hard rock guitars and funk inspirations. What “Abobo” and “Big Blag” make clear is that the SNES version of the Battletoads & Double Dragon soundtrack is less interested in the intriguing moodiness of the Genesis port and instead simply goes for succinct, entertaining rock and funk action. 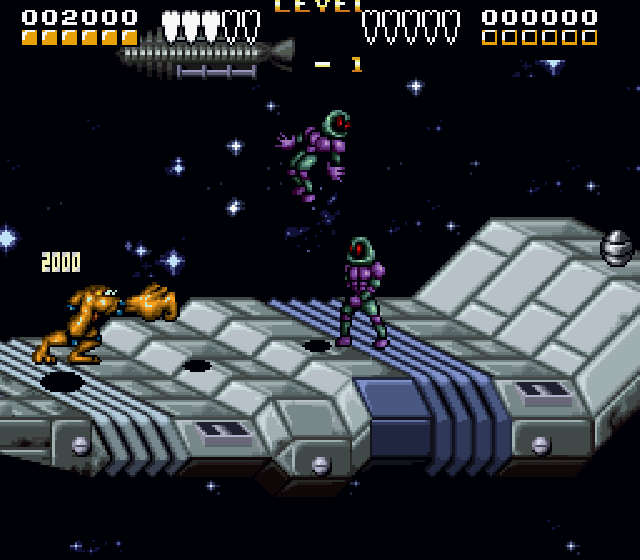 The SNES score isn’t as creative as the Genesis soundtrack, but ultimately more successful. It keeps up the momentum until the last track, while the Genesis score begins to fizzle out towards the end. That’s largely due to the proliferation of repetitive material on the Genesis soundtrack, which doesn’t have the palette of instrumental colours to draw upon that helps the SNES port to dress up its musical ideas in new disguises. The advantage of having more instruments to work with becomes particularly obvious on “Roper”. On the Genesis, the track feels a bit too fragmented to make the most of its initially intriguing mood. On the SNES, Wise can fully indulge in the Battletoads & Double Dragon soundtrack’s most ambitious genre mix that brings together introspective yet catchy synth melodies, funk brass fanfares, tribal drumming and fiery guitar salvos and sludgy riffs. It’s particularly the crunchy guitars that help to connect the different song sections better than what the Genesis soundtrack accomplishes. It also doesn’t hurt that the SNES version achieves more impressive changes in dynamics, making the track’s changes in direction exciting rather than jarring. If someone questions the SNES’ rock credentials, point them in the direction of the Battletoads & Double Dragon soundtrack. 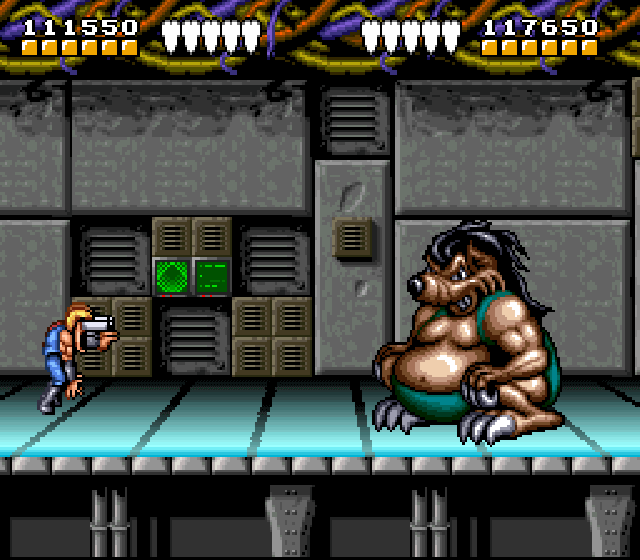 The Genesis version of the soundtrack is discussed above at some length already. The NES original is surprisingly underwhelming and no match for the 1991 Battletoads NES score. Tracks are fairly short and repetitive, evidencing little inspiration or energy. In fact, this might be Wise’s least impressive Battletoads soundtrack. The Game Boy port has a bit more grit and power than the NES version, while excising some material and compressing other pieces. That being said, the end result still isn’t anything to write home about.